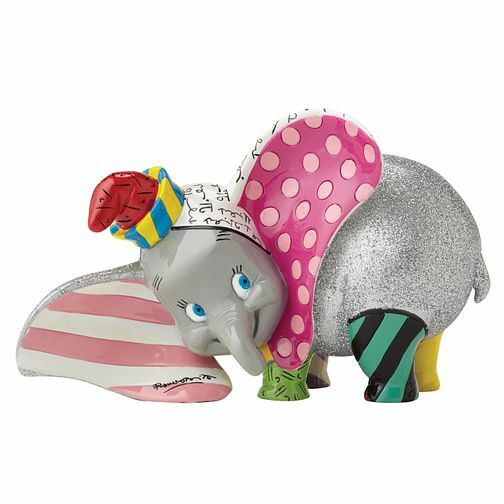 Featuring the unmistakeable folk art style of Jim Shore, this vibrantly patterned, hand-painted Disney Britto figurine of the loveable Dumbo is sure to brighten anyone's interior décor. A lovely gift. Disney Britto Dumbo Figurine is rated 4.9 out of 5 by 7. Rated 4 out of 5 by Anonymous from This product is great in its appearance Happy with the product it’s self. The design and colour is suitable for the person I have purchased it for. It’s a good size. Rated 5 out of 5 by Anonymous from Beautiful elegant collected item Beautiful easter gift for my sister who collects elephant ornaments very pretty and great quality item.